The bullpen issue was apparent again as the Mets prevailed. Phils teammates Abraham Nunez and Ryan Howard collide while trying to field a pop-up by the Mets' Jose Reyes. Charlie Manuel says his team is out of synch. NEW YORK - Charlie Manuel didn't need to say much after this one. His body language revealed the depth of his disappointment. Billy Wagner had just struck out his (cough, cough) old buddy Pat Burrell for the final out of another ugly Phillies loss, and now the New York Mets were lining up on the infield to exchange postgame high-fives. From his perch in the losing dugout, Manuel stood alone and stared blankly out onto the field for several moments. Finally, when the Mets were done glad-handing one another, the Phillies manager put his head down and made the long walk up the tunnel to the losing clubhouse. It wasn't supposed to be this way for the team that made getting off to a fast start its spring training mantra. And it certainly wasn't supposed to be this way for Jimmy Rollins' team to beat in the National League East. But it is. The Phils fell to a dismal 1-6 in getting hammered, 11-5, by the Mets in front of a giddy crowd of 56,227 at Shea Stadium yesterday. Cole Hamels delivered his second strong start in as many outings, and Chase Utley and Ryan Howard belted important home runs. Howard made Mets manager Willie Randolph pay for pitching to him with first base open in the sixth. 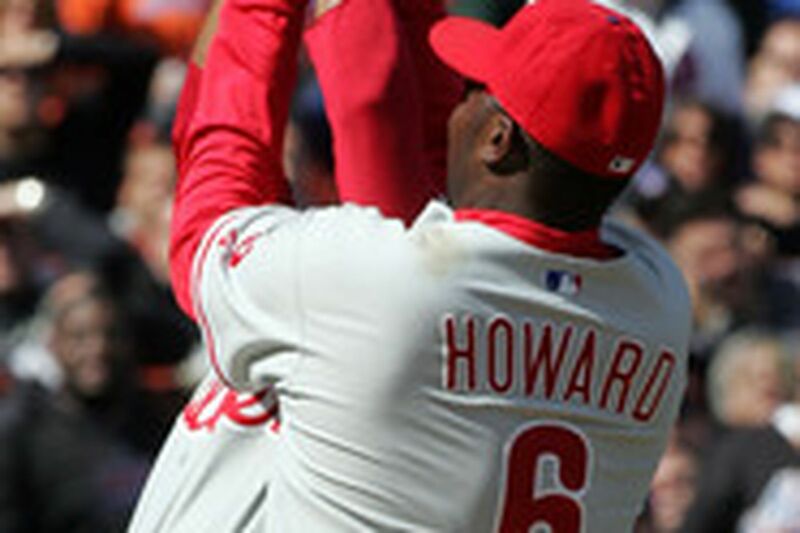 The resulting three-run homer gave the Phils a 5-3 lead. It wasn't enough cushion, though. The Mets ravaged the Phils' problem-spot bullpen for eight runs, seven of which came in the decisive eighth inning. "Any time you lose like that, it's hard to take," Manuel said. "We're just out of synch right now. We can't put a good game together. "We do some good things. Then all of a sudden, our game falls apart. We've got to improve. I definitely didn't want to be 1-6. But there's a lot of season left to play." While that thought might be comforting to Manuel, it could be scary if the Phils don't start getting better work from their bullpen, which also failed to protect late leads in the first two games of the season, both losses. Yesterday, Manuel showed just how much he's searching for an arm to get consistent outs late in the game. He allowed Geoff Geary, who had come on to get an important out in the seventh, to hit with a one-run lead in the top of the eighth so Geary could continue pitching in the bottom of the inning. Manuel said he preferred not to use Ryan Madson, who pitched two innings on Saturday night, nor Antonio Alfonseca, who worked an inning Sunday. He said he did not want to employ a double-switch with centerfielder Aaron Rowand or third baseman Abraham Nunez because he wanted his best defense to stay on the field. He also wanted Burrell's bat to stay in the lineup. So, the eighth inning belonged to Geary. Actually, it belonged to the Mets. Geary gave up two hits and two walks, and threw a wild pitch that reached the backstop on the fly. The Mets loaded the bases with one out when pinch-hitter Julio Franco drew a four-pitch walk. Geary still had a chance to get out of the inning with the lead as dangerous Jose Reyes came to the plate. With the middle infield at double-play depth, Reyes bounded a ball to shortstop Rollins' right. With the speedy Reyes running, Rollins would have had a tough time turning two. He didn't get anything, though. Much to the delight of the big crowd, Rollins made his first error of the season as the tying run scored. The go-ahead run came home on the wild pitch. Reluctant reliever Jon Lieber followed Geary out of the pen and was ripped for a pair of runs. "We've got to fix our pen," said Manuel, sounding as if he was sending a plea to general manager Pat Gillick. "If it's in-house and someone steps up, good." Improvement also needs to be made swinging the bats with runners in scoring position. The Phils went 1 for 9 with runners in scoring position yesterday, falling to .188 (13 for 69) for the season. "From an offensive standpoint, I think we're a little tight," Manuel said. "I know we're capable of knocking in runs. "We're trying too hard. We're pressing. You've got to stay focused and loose and relaxed. It's like going in a slump. If you're 0 for 10 and you start fighting it, you'll be 0 for 20 before you know it."